In a perfect world, you get to buy an iPhone and enjoy the best data and voice service on it. What’s the point of picking up such a powerful device when the carrier absolutely fails in delivering anything close to what you are promised upon signing its contract. Unfortunately, that has been the case with AT&T since the very first day of iPhone. While we can give AT&T grief all day, the company is trying to improve its service and provide small business owners and individuals with tools to improve the quality of service at home or their place of business. AT&T 3G MicroCell is the latest effort by AT&T to give its customers an easy way to improve the quality of service at their location. It’s like having your very own mini cellular tower. 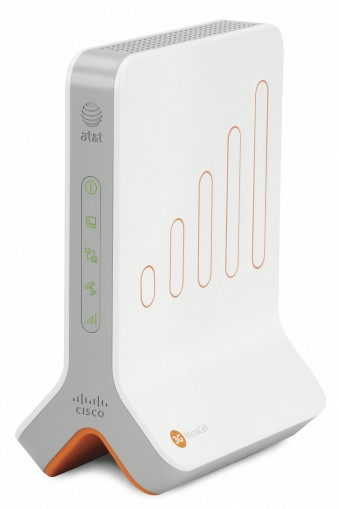 The device takes advantage of your existing broadband connection to give you a better chance of staying connected to the world even if your area is not known for great AT&T coverage. The device is not created to handle a whole lot of people (up to 4) and is not exactly free. But it’s better than having to get rid of your iPhone for bad cellular coverage. According to AT&T, this device is designed for those who are unfortunate enough to live in buildings that are constructed from material that reduce coverage quality. By picking up this device you should be able to get around that. It covers both voice and data by up to 5000 square feet. In order to install the device properly, you are going to need a window. So as long as you don’t conduct your business from an underground base, you should be fine there. The device is not free. It will cost you $150 initially. If you pick up other AT&T services with your purchase, you may be able to reduce the price to free. Security is another issue with such a device, but AT&T promises that the device is very much secure. Since the device is portable, you can take it with you as long as the area you are moving into is covered by AT&T. Should you get a MicroCell? It depends on your needs. In some cases, you may be able to use a regular signal booster to improve the quality of service you are getting in your area. But if you live an area that gets bad AT&T coverage, one of these units could come in handy. The device could have been cheaper, and it may be in the future. But at least AT&T is doing something about its service issues. Your take: is AT&T’s Microcell worth the investment?